Our reputation for fair pricing and quality service is well known. DV Systems (Devilbiss) no longer makes air compressors less than 5hp. In the past Devilbiss made several different pumps for the HVAC industry including the 123, 223, 120, 220, 44642 and 44643. We do however have a new replacement for the Devilbiss 220 pump. We also have an exchange program for rebuilt 123, 223, 44642 and 44643 pumps rebuilt and ready to ship. Many of these HVAC/Climate Control Air Compressors were branded under the name Johnson Controls. 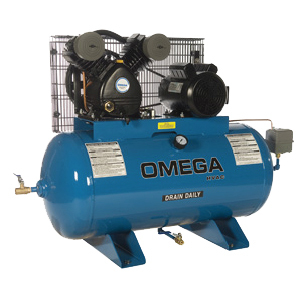 We now sell the Omega Climate Control compressors. They make a great compressor from 1/2 hp to 30 hp. Simplex and duplex units are available for use as HVAC/Climate Control Air Compressors. Air receivers range in size from 30 gallon to 120 gallon. We also can supply inline filters and refrigerated air dryers for your HVAC control system. In addition there are duplex compressor controllers available for multiple compressor systems. These controllers can alternate lead and lag between compressors. They can also limit run time and ensure redundancy in your system. Call Centrair Air Systems at (705-722-5747 ext.1) with any questions or a quote on a specific compressor.